Existing data centers often lack the power and cooling capacities to support the hardware of today and tomorrow. Despite this shortcoming, organizations may not have the capital resources to design and build a new facility. To address these challenges, 42U offers a viable solution to give legacy data centers a new lease on life: high-density, in-rack cooling. In-Rack is the most precise cooling available, as the rack and the air conditioner operate in a closed relationship with one another. Cold air has no choice but to pass through the servers; hot air has no choice but to pass through the heat exchanger. In-Rack cooling provides a computing environment-a microclimate-that is thermally neutral to the rest of the room. Like its sister strategy (In-Row Cooling), In-Rack Cooling benefits by distance. The airflow paths are small, requiring less fan energy. In addition, the exhaust air is captured at its hottest point, maximizing the delta T of the cooling coil. Users familiar with containment strategies can think of In-Rack cooling as containment fully evolved: both hot aisle and cold aisle in the same footprint. In-Rack cooling, depending on the product, will use chilled water or refrigerant as the cooling medium. Though there are exceptions, the majority of products do not bring liquid into the actual server rack. The air conditioner, with water connections, is housed in an adjacent, but separate enclosure. The equipment at the rack level is still air cooled. Chilled water units will require connections to chillers for chilled water supplies and ultimate heat rejection. For lower density racks, fans may be a viable solution to increased cooling, by facilitating the movement of ambient air through the rack. Fans can be mounted on the roof, sides, and doors or can be incorporated directly in the rack as slide out fan trays. To improve the effectiveness of any fans, proper airflow management, through the use of blanking panels and sealing tape, is recommended. Both cabinet fan assemblies and top & bottom mount rack fans are available. While single-phase, 115V fans are most common, many units are available in different voltages, in AC or DC configurations. 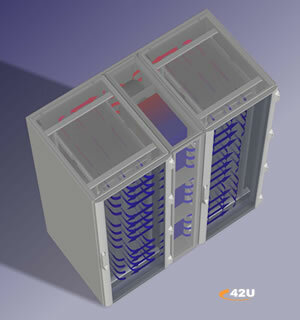 42U has seen the benefits of In-Rack Cooling firsthand. Our install base ranges from small computer rooms, to enterprise data centers, to high density wiring closets - diverse environments that are decidedly more scalable and efficient than their previous lives. These unique environments require equally unique product knowledge and application experience. Call 1-800-638-2638 to speak to a product expert.